Please have all of your documents in order, all your i‘s dotted and t‘s crossed, because petty bureaucrats love nothing quite so much as rare, random, but rigid enforcement of seemingly arbitrary and capricious rules and regulations. No matter how many “destination experts” on the travel forums try to tell you otherwise (“oh, they never check that…”) you don’t want to be the exception. LIR used to be a breeze but flights have quadrupled in recent years and now it’s usually a mob scene with long check-in lines. Every traveler needs their own passport (yes that includes one day old infants). If you are traveling on a U.S., Canadian or European Union Passport you do not have to apply for a visa in advance. Currently (2019) Costa Rica requires that your passport must be valid for one day – on the day you arrive. There are lots of outdated articles on the internet because historically immigration has required passports to be valid for periods varying from 30 days to six months. We typically renew our passports 90 days in advance and if your passport is good for at least three months you’ll avoid potential problems. 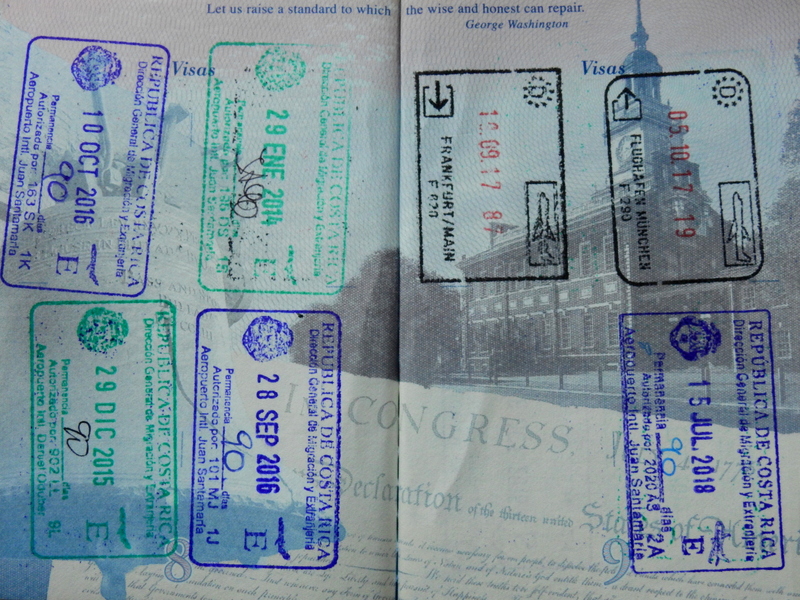 Some other countries require advance Visa applications or have other passport validity requirements. Please see the website of the Dirección General de Migración y Extranjería for details. – or – download the PDF guide to Costa Rica Visa requirements. If you have a round trip ticket with all the legs on one airline within a total of 90 days you are covered and can skip this section. If not, you may need to present a printed out copy of the ticket for your flight home before you board your flight to Costa Rica and again when you arrive in Costa Rica. If you’re leaving by bus, taxi or ox cart you will need some way to prove it. The authorities want to know that you’re not planning on moving to Costa Rica permanently without the appropriate residency status. For years enforcement was actually very rare but it did happen occasionally. In early 2018 Costa Rican immigration suddenly decided it was important but fortunately our airline was aware and the gate agent in Denver printed return tickets for everyone as we boarded our flight. On arrival the immigration officers checked the first few printouts but once they realized that everyone was prepared they stopped looking. A ticket confirmation app on your phone may work but a hard copy is preferred and they won’t let you use their Bluetooth printer at the immigration desk. Each visitor is required to show they posses $US 100 for each 30 days or part of 30 days of their Visa. Since a standard tourist Visa is 90 days this means $US 300 per person. That could mean a family with three kids needs to carry fifteen hundred bucks in cash but this is rarely enforced. We’ve only heard of it being used to harass “undesirable looking elements” headed to the “hippie” gatherings of the Rainbow Family and Envision Fest. Typically a Costa Rica tourist entry visa stamp is valid for 90 days but sometimes it’s for “Permanencia §~@ß dias” as seen on the green entry stamp at top left center. Although 90 days is the standard length of a tourist entry permission it is not obligatory. You may receive 30 days or 1 day at the discretion of the agent wielding the stamp. There’s nothing you can do about it if you get less than you wanted but at least if you’re aware you can avoid the overstay fines and banning from returning by doing a border run. There are a few other obscure requirements like a yellow fever vaccine if you’re arriving from some African or South American countries but it’s impractical to list every one for every possible country so if you have any doubts check with your embassy, consulate or airline. The airlines try very hard to make sure they have all the requirements covered before they let you on the plane because they’re responsible for the cost of flying you home if you get turned back at the border. 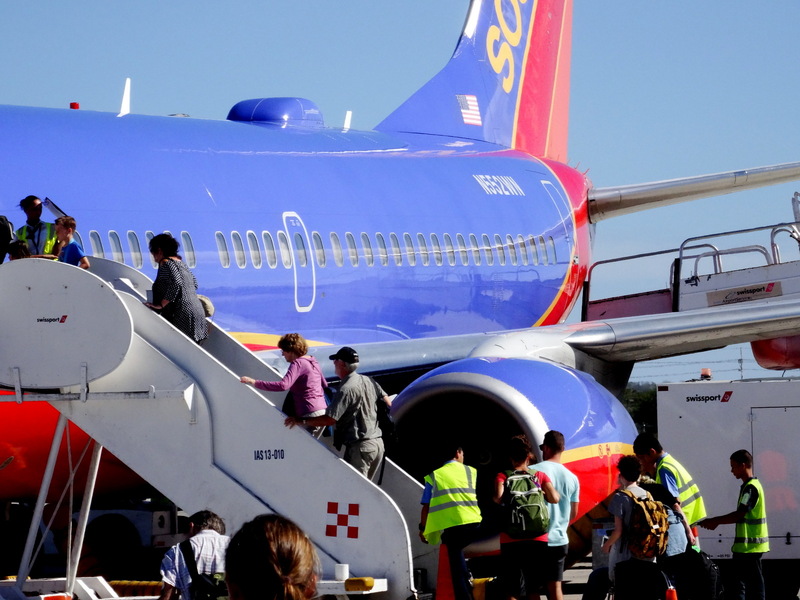 The accepted advice is to arrive at the airport 3 hours prior to international flights. The recommended hour after checking in isn’t so you have time to get through security or buy a $14 slice of pizza (no kidding, bring your own snacks) in the terminal. This is so the Costa Rican government agencies have time to check up on you before letting you leave. Usually you have some wiggle room on statements like “at least one hour in advance” but NOT in this case. The airlines are actually required by law to shut you out at the check-in window if your flight departs in less than an hour. The time is used to look for your passport on the OIJ most wanted list, confirm your immigration status, and most importantly find speeding tickets on your rental car. 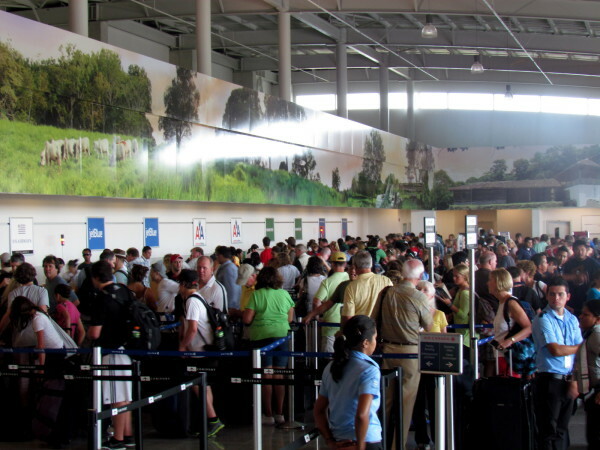 We typically arrive 1.5 to 2 hours prior to our flight but we have priority status, global entry, and a willingness to miss our flight because we don’t mind being stuck in Costa Rica a few extra days. 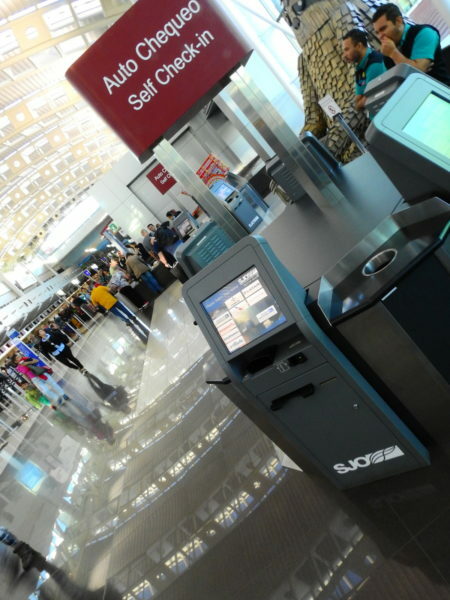 Early in 2019 new kiosks for self check in allow travelers on some airlines to skip one of the lines. The lines at the regular check in counter were out the door but no one has discovered the new self check in Kiosks as evidenced by the yawning agent in the background. Self check-in Kiosks at SJO were introduced in 2019 and by April participating airlines included United, Southwest, American, Air Canada, Alaska, Volaris, Avianca, Latam and Copa. If you followed our advice on the way down your passport will still be valid for at least a few weeks and you’ll have nothing to worry about. The $29 per person departure/exit tax used to be paid in person but in 2014 the government announced it would be included in airfares. Five years later most tickets include the tax. 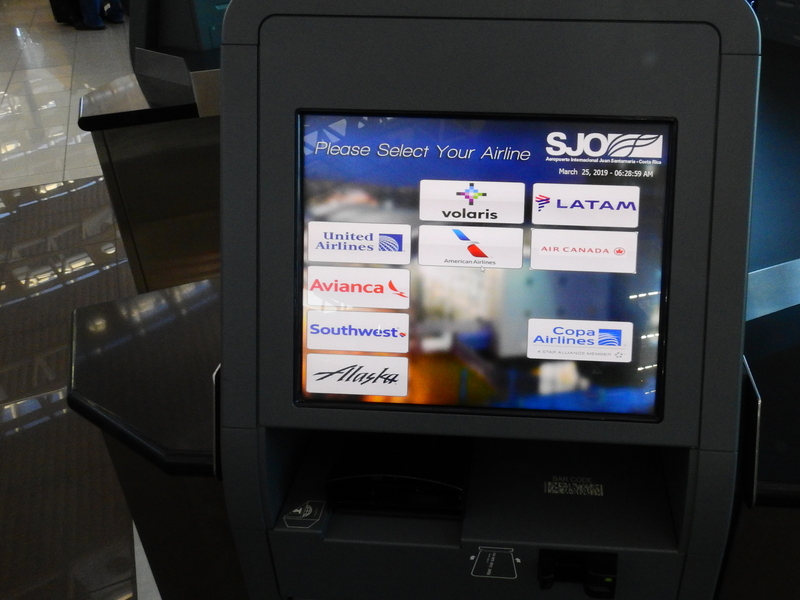 Please see the current airline list and how to determine if you already paid. For years Costa Rica allowed liquids through security but then confiscated them at a secondary check at the gate as you boarded the plane. In 2016 they came in line with the rest of the world and you have to have the standard ziplock bag with little 100ml (3.4 oz) or smaller transparent liquid containers to pass through security. Beverages purchased on the concourse may now be carried onto the plane. There are still sometimes secondary manual inspections at the gate before boarding so you may also want to be a bit more circumspect than normal about what you carry in your carry-on because the contents may be removed in full view of other passengers. Starting in June 2018 the U.S. TSA implemented new rules on powdered substances in carry on luggage on international flights. Quantity is limited to 12 oz and it may be subject to secondary inspection and confiscation. The most popular souvenir from Costa Rica is a 500 gr bag (approx 1 lb) of ground coffee. Put it in your checked bag or buy whole beans. Sometimes Costa Rica is a bit unclear on the concept. We’ve had sea glass confiscated because of misinterpretations of the laws prohibiting collection of sea shells and other flotsam – sea glass is not protected under maritime ecology rules…it is garbage. When in doubt it’s best to stick it in your checked bag. However, never put valuables – cash, camera, phone, laptop, tablet etc. – in checked luggage in Costa Rica. If you are from the U.S. and travel frequently by air you may want to consider the Global Entry/Federal ID/TSA-Pre program. We Love it. It costs $100 for five years ($20 a year). There are other private programs that cost from $120 up to $180 per year but this is one case where the government version is just as good and almost ten times cheaper. On U.S. domestic flights you skip the security line, keep your shoes on, leave your computer and other electronics in your bag and breeze through pre-check. On international flights it only works in the U.S. airport but it lets you skip to the front of the customs and immigration lines and then also gets you through security if you have a connecting flight.